Quite old. Physically looks mid-20's. 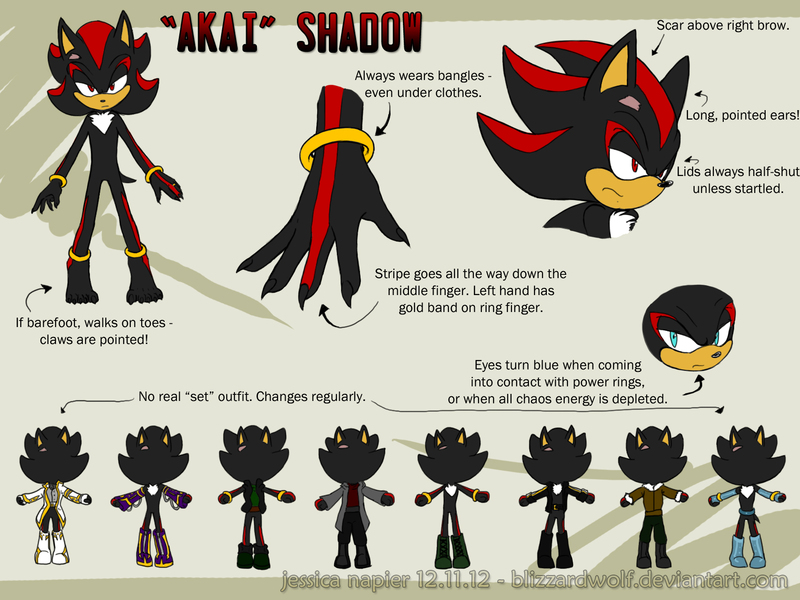 "Akai" does go by Shadow in his dimension, but whenever he is in another (or another zone), he refers to himself as Akai to help ease confusion. Akai is not necessarily outgoing, but he is not a recluse either. He is very vain and self-absorbed, so he always has to look flawless. He will snap at anyone who dares to insult his ego. He is very patient unless someone is teasing him, in which he is quick to anger and quick to resort to violence to get them to stop. He absolutely hates being called "faker". Akai is very intelligent and knows quite a bit about the ways of the world. When he becomes frustrated and defensive, he often uses a much more colorful vocabulary than on his usual terms. Akai's favorite food is strawberries, especially strawberry short cake. He is also a bit of a drinker. He hates people poking fun at him or mocking his memory (which has been proven time and time again to not be spectacular). Akai is married and has three children. Two boys by his current wife and his oldest son - a test tube baby. His wife goes by the name "Azu". Sable is his oldest, Xander is the middle child and Xun is the youngest. In the future, he has two more children, a boy and a girl, both by his current wife. Zak and Elizabeth. Despite Akai's desperate attempts to ignore this fact, his "father" is indeed Black Doom. He never knew his mother, she was a project on the ARK that passed away before he was awakened. Akai lives in an alternate universe where Chaos Emeralds are actually living beings (his wife is one of them) and there is a difficult time keeping "zones" in tact and away from one another. There are often dimension tears that cause problems for him and the group. Often times they have to interact with their counterparts, which can prove to be very difficult. Akai's ears are longer and more pointed than a standard hedgehog. He also has a scar above his right brow, the only scar he has and the only scar he will retain. The red stripes on his arms go down to his middle finger and end at the tips. The ones on his legs end at the base of his foot on the outsides. His eyes are almost always red, unless he comes into contact with power rings or has all of his chaos energy stolen away from him. They then become a bright shade of blue and he has difficulty seeing. He usually wears boots, but otherwise his attire varies greatly. It can be anywhere from a full suit to nothing but boots and arm warmers. He rarely wears pants (unless it is very, very cold), but often wears jackets. Akai is never seen without his inhibitor rings ("bangles") or gold band on his left hand's ring finger. He is otherwise always changing accessories. I wanted to draw a ref of Akai, even though... you know... he's Shadow. Various outfits on the bottom. Having a little fun with it. Kinda like how the large hand came out (except for the pinky). I know they're called inhibitor rings, hahaha. I call them bangles as it's easier to type/say. :) Thanks, too! !